Thanks again to all who proposed a program or workshop for AALL 2019. The Annual Meeting Program Committee (AMPC) reviewed all submissions using a detailed evaluation rubric, and the AMPC’s content team leaders met in Chicago last week to select and schedule the programming for next year, including the must-have programs that AALL members requested. The AMPC is in the process of contacting proposers, and programs will be announced later this winter—stay tuned! 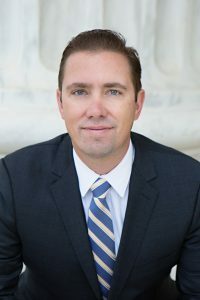 Shon Hopwood’s path to becoming associate professor of law at Georgetown University Law Center and co-owner of Prison Professors L.L.C. is somewhat unusual. His journey began not at a law school, but rather, federal prison, where he learned to write briefs for other prisoners while serving a 12-year sentence for bank robberies. While incarcerated, he prepared two petitions for certiorari, which were later granted review by the United States Supreme Court—he also won cases for other prisoners in federal courts across the country. Learn more about Shon. Mark your calendars and book your housing—you don’t want to miss the 112th AALL Annual Meeting & Conference! AALL members are constantly finding new ways to better support their stakeholders, staff, and colleagues—and sometimes even small endeavors can result in big improvements. But too often, their solutions roll out with little acknowledgement. You may have heard about our upcoming AALL Innovation Bootcamp: Add+Venture Initiative. We’re assembling a dynamic lineup of presenters comprised of AALL members and other thought leaders, and we’re on the lookout for members who have addressed workplace challenges by putting creative ideas into action. If you know an unsung AALL member behind a unique solution, we want to hear about them! Join legal information professionals to learn how to amplify your skills and resources, add methods for new value creation, build support for your ideas, and foster a culture of innovation. Registration announcement coming soon. 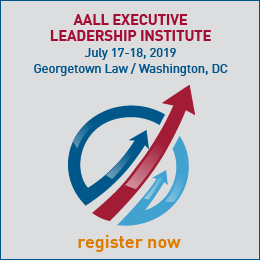 Sponsored by AALL in partnership with Bloomberg Law. Learn about how you can influence your members of Congress and build productive, long-term relationships with lawmakers and their staff at our next online advocacy training, “The ABCs of Advocacy: Law Librarians and the 116th Congress.” You’ll learn about AALL’s policy priorities and what the makeup of the new Congress means for our issues, identify upcoming opportunities for action, and come away with proven strategies for delivering an effective message to your members of Congress. The inaugural AALL State of the Profession Survey was sent to members with expertise in law libraries and equivalent organizations on November 8. The goal of the project is to deliver a report to identify, clarify, and support the value of your individual and collective roles. Jamie Baker, a member of the advisory group that created the survey, explains why your input is crucial. If you haven’t received an invitation, please contact ARI at ari@associationresearch.com with the following subject line: AALL State of the Profession Survey Requests. Those who complete the survey can opt in to get a 10 percent discount on the final report and/or to win a $100 gift card. Additional information can be found on AALLNET. Have you ever wondered what it takes to get an article published? Have you thought about writing but weren’t sure where to start? There is enormous interest in producing scholarship, but many of us struggle with making time, developing topics, and staying motivated. This webinar includes a panel of editors from five major law library publications, who will demystify the writing and publication process by providing insight into what makes a good article, what the editors look for when they review submissions, and how to build collaborative relationships with your editors. The panelists will discuss the unique attributes of different publications and help authors think strategically about publication avenues. They will also share tips for writing and producing scholarship, trends, and areas in need of more research and exploration. The next AALL Management Institute is in 2021. Established in July 2000, the grant funds research projects that create, disseminate, or use legal and library-related information. For inspiration, review the list of topics awarded grants in past years (under the heading “Recipients” 2000-2017, at the bottom of page) and explore the 16 broad research topics outlined in AALL’s Research Agenda. Are your patrons too busy to learn about research? 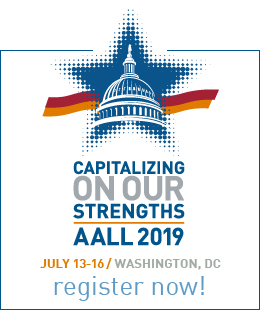 This 2018 AALL Annual Meeting session, while geared toward academics, has plenty of ideas for librarians from all library types on how to engage users and teach them small bits of information very quickly. Following a brief description of their slightly different methods of capture and training, co-presenters AJ Blechner from the Harvard Law School Library and Heather Joy from the Hugh & Hazel Darling Law Library at Chapman University reenact a couple of example lessons and share how to create lightning lessons, including issues to consider when implementing them. Fear of failure can often creep in for those of us who are constantly trying to identify new ways to best meet the needs of our users. The fear of little-to-no participation in a workshop can cause you to rethink if it’s worth the time and effort to plan and promote. Moreover, the thought that a website revision may irritate some loyal users can prevent you from trying to integrate more innovate features and tools. The fear of failure can be debilitating at times, sapping all creativity and rendering the best librarians unable to maximize their efforts toward enhancing resources and services. However, failure doesn’t have to be this way. True leaders are those who see failure not as something to fear and avoid at all costs, but instead as something that will happen more often than not on the way to success. Simply put, if you’re not failing every now and then, then you’re not innovating. Tiffany L. Camp was selected as the AALL Diversity & Inclusion Committee’s November Librarian of the Month. Greg Lambert and Marlene Gebauer’s latest “The Geek in Review” podcast features an interview with AALL Executive Director Vani Ungapen. 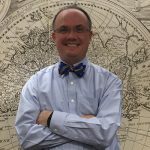 In this month’s member profile, Thomas Sneed, associate professor and director of the Law Library at Washburn University School of Law in Topeka, Kansas, talks the AALL Career Center, community, and how KnowItAALL keeps him informed.